Arthritis is a common medical condition which is not well understood, it actually is not a single disease but an informal way of referring to the joint diseases or pain. Arthritis can be of hundred types and can affect people of all ages, sexes and races. This condition is most common among women and occurs more frequently as people get older. Common symptoms include swelling, pain and decreased motion range. The symptoms are not frequent and can come and go, and when present, they can be mild, moderate or severe. The condition can stay same for years and get worse over time, those having severe arthritis can suffer from chronic pain, and find it difficult to walk or climb stairs. If you suffer from any of the below-mentioned arthritis symptoms, get in touch with arthritis doctor in Delhi. Osteoarthritis symptoms include joint pain and progressive stiffness. Rheumatoid arthritis symptoms include swelling, pain, inflammation and stiffness in arms, legs, wrists and fingers and the pain is severe in the morning time. Infectious arthritis includes fever, chills, joint inflammation, and sharp pain that can be linked to some injury or infection. You notice pain and stiffness in arms, legs, back after you sit for a short period of time or after you wake up in the morning. Sooner the Arthritis Treatments in Delhi are begun; more effective result likely to be because it can reduce the risk of long-term damage to the joints and bones. Over the counter medication such as acetaminophen and non-steroidal anti-inflammatory drugs ( NSAIDs ) offer great relief from arthritis pain. They reduce the inflammation and can also be helpful in the types of arthritis where inflammation is not the main problem. Steroids are powerful and natural anti-inflammatory agents they can be injected into the painful joints or muscles or can be used in the tablet form. They are used mostly for inflammatory arthritis and connective tissue diseases. 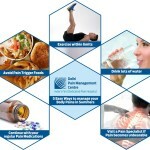 There are several creams and supplements that can also prove to be beneficial for the pain. Doctors recommend physical therapies for reducing the symptoms of arthritis. Physiotherapy is recommended as it helps in improving muscle strength and general fitness of the body. Physiotherapy can be combined with pain relieving treatments such as heat packs/ ice packs or massage for better results. It is recommended if the damage caused to the bones and joints is severe. DPMC offers effective Arthritis Treatment in Delhi, for more information, get in touch.